The cornerstone of a successful company is the satisfied workforce. Satisfied colleagues are more motivated, actively participate in the company endeavors and thereby promote the further development of the entire organization. At it-economics, we constantly work to improve and to provide a motivating environment. In the successful recent years, the IT consulting, with a focus on digitization solutions and agilization, has already been awarded the title "Great Place to Work" and is consistently ranked among the "Best Consultants". 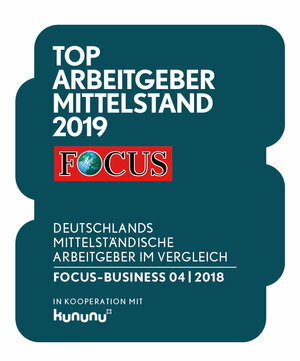 Outstanding placement in the ranking of Focus-Business "Top Employer SME"
The business magazine Focus-Business, in cooperation with the employer rating platform kununu and the market research company Media Market Insights, gave today the awards Germany's "Top Employer SME" for the second time. Among the 2,700 companies on the list, it-economics ranks among the top 5 percent of all employers. The working atmosphere, supervisor behavior and working conditions, work-life balance, gender equality and further training are rated particularly high. "We are delighted to have been named "Top Employer for Small and Medium-Sized Businesses", but above all, we are delighted to be ranked so highly. It shows us that we have the right approach: hearing the feedback from our teams, developing joint solutions, taking collaboration and our teams more seriously than the rigid structures and inflexible processes. We want to continue to improve in the future and are always looking forward to welcome new colleagues in our teams, "says Torsten Klein, CEO of it-economics. For the ranking "Top Employer SME 2019", more than 13,000 companies with a profile were evaluated on the employer rating portal kununu. Companies from the DACH region (Germany, Austria, Switzerland) made it to the list with at least ten Kununu evaluations, five of them done in the past two years, an average kununu score of at least 3.5 out of 5 and more than 10 but less than 500 employees. The placement in the ranking is determined by company size, kununu score and total number of ratings. Visit our career page to find out more about it-economics as an employer and to see our open positions at our locations in Germany, Switzerland and Bulgaria.